I’d like you to meet my BFF in the spice cabinet: Miracle Blend. The list could go on and on, but you get the idea. Mine is in that cute little shaker because I buy it by the pound. It’s that good. I’ve actually been to their little place in Michigan (on a trip to see The Yankee’s family) and it’s ADORABLE. And they let The Kiddo eat a ridiculous amount of their crackers, which he actually liked (that’s another miracle). So get some! Go now! The Yankee loves their Char Broil It for steaks, and I love the Lemon Pepper on chicken. But the Miracle Blend, people. Can’t live without it. Just ordered some of this. Since my weight loss surgery, I can only eat a small portion, so that portion better be popping with flavor to keep me satisfied. I can’t wait to try it. Ordered the Miracle Blend and Char Broil It. I’m excited to try both! OPK – I DO LOVE THIS STUFF! 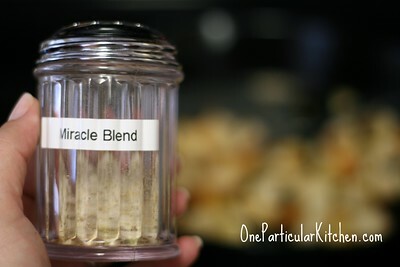 I used the Miracle Blend on a chicken I roasted this past weekend, and I used the Char Broil It on some turkey burgers last night. Excellent! I will keep buying this. Thank you so much for sharing!